Have you had an HVAC technician tell you that you have an air conditioner Leak? Do you wonder if that is truly the case? Below I have listed some of the telltale signs and things to look for to determine if you truly have a Leak. A refrigerant leak will typically start out very small and not get noticed for a year or more or until one day your air conditioner is no longer cooling. Unlike a car that uses its gas until it is gone and then you refill it, refrigerant does not work that way. An air conditioner must have full capacity of refrigerant to work correctly. Any sign of refrigerant levels not being full is a sign that it has leaked out. When your unit stops cooling, you may notice ice around the pipes on the outside of your house or located at the evaporator coil. This is a good sign that you might have a leak. But blocked air vents and returns can cause this too. A small leak over time will cause a decrease in the cooling of your air conditioner unit. It is not something you would notice suddenly, because it happens over time and is gradual. You would have to pay close attention to the amount of time the unit runs or the higher electric bills. For example, if every summer your air conditioner cooled your upstairs home master bedroom with no problem but this year you suddenly notice that on those hot days it never gets as cool as it used to, that is a good sign to get your levels checked. To a trained eye, technicians can spot a leak sight in many cases. 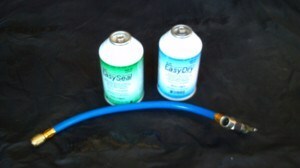 With R22 systems, oil is mixed with the refrigerant and leak sites will be greasy or stained from the oil residue. Sometimes this is visible to the trained eye. If you determine after reading these signs that you have a leak. Call a local HVAC technician to come out and check out your unit. Do not let someone to just top-it-off as even though you may have only had to do it once a year, leaks get larger and you might just find yourself spending 400.00 to top-it-off only to find it empty one month later.